This fabulous building was specifically designed and constructed to house the fossil fish collection. Stage 1 opened in 2000 and Stage 2 in 2002. 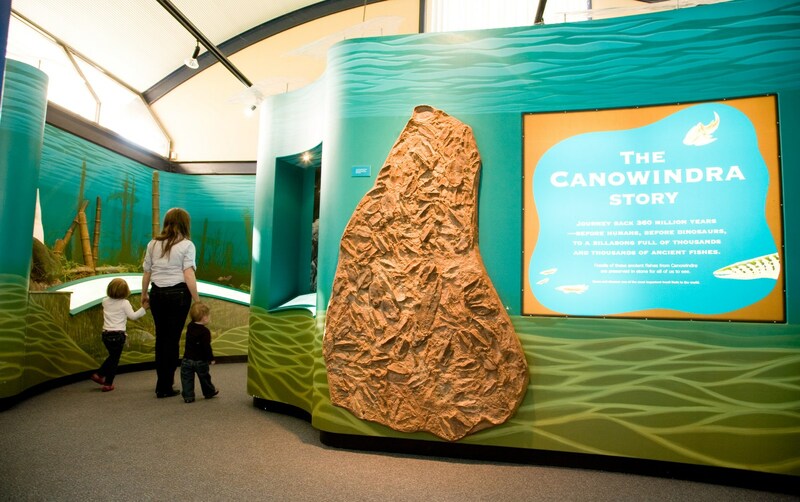 The Canowindra Story is a recreation of the Devonian period and boats models, story boards, touch screen and real fossils. The outdoor area is large, green and clean. 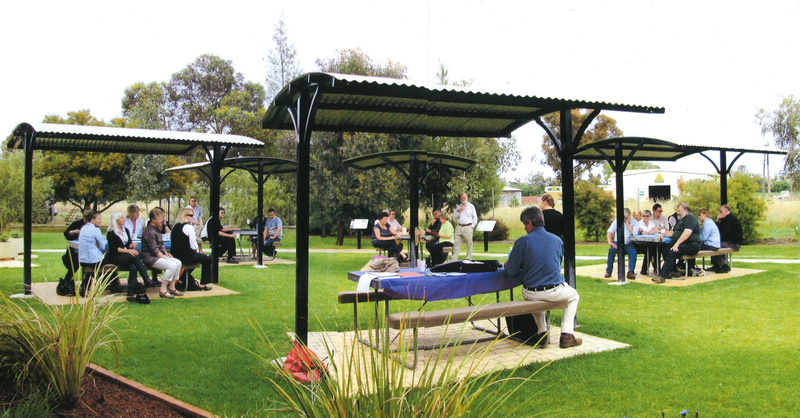 The picnic tables are constructed of granite sourced from nearby Eugowra and are circled by native trees and shrubs. Imagine a world ruled by fish! Long before dinosaurs roamed the earth, the mighty rivers of the Central West teemed with bizarre ancient fishes–armoured fishes, fishes with lungs and huge predators with jaws like crocodiles. Thousands of their fossils were found at Canowindra and give us a unique glimpse into life during the Devonian Period–the Age of Fishes. A chance discovery in 1955 revealed an extensive fossil bed dating from the Devonian Period. This 360-370 million year old fossil deposit contains the remains of thousands of freshwater fish. Many were new to science. The best of the fossils recovered so far, are now on public display at Canowindra at the Age of Fishes Museum. Given there is a plan to reopen the excavation site, who knows what other exciting finds will be made? It’s possible a complete early tetrapod–an ancestor of modern 4-footed, vertebrate, air breathing animals could be found! Visitors are able to get up-close and personal with the fossils on display and even touch them! Come and visit and learn more about fossils, geology and evolution from one of the most iconic and unique fossil discoveries on Earth. The Age of Fishes Museum offers visitors and exciting range of permanent exhibitions and activities, occasional travelling exhibitions and well presented additional facilities, such as the Grossi gift shop, a regional Visitor Information Centre, as well as picnic and BBQ facilities, a timeline walk, a Fishes and Rods games board and fossil dig pits for young visitors. Audio tours are available for adults and children and the museum is also fully accessible. Entry includes an audio tour or guided tour. Grossi Gifts sells educational toys books, boxed and packaged fossils, along with a range of local and regional produce sourced from around Canowindra and Cabonne.